A great option for decorating your Tiki bar or outdoor Hawaiian Luau party space! SKU: 54719 Categories: Banners, Bunting Flags, Garland, Hawaiian Luau, ON SALE! 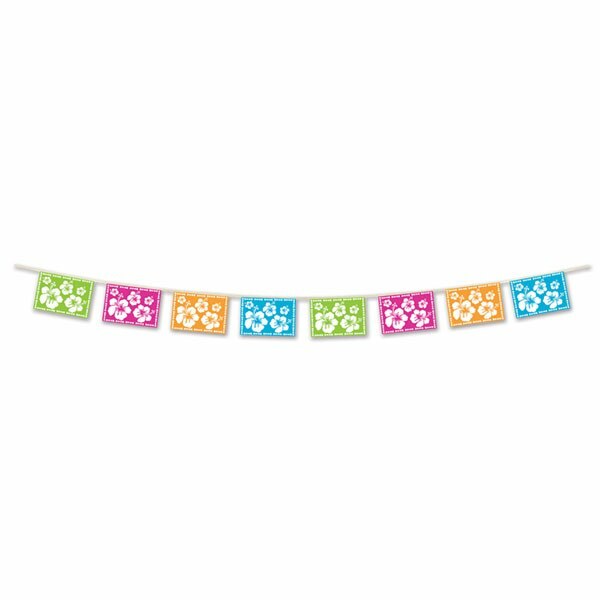 The Luau Hibiscus Pennant Banner is a great option for decorating a Hawaiian Luau themed event. It is made from plastic so is perfect for decorating around your Tiki bar or any outside area. If feature a white hibiscus flower print on bright blue, pink, green and orange flags. The print is on one side only.